Hammerton Studio. Co-founder Levi Wilson tells us why. At the heart of Hammerton Studio’s artisan-crafted lighting collection is authenticity—authentic materials (think kiln-fired fused glass and hand-hewn steel), authentic design and authentic production—each fixture is made right here in the USA. We caught up with co-founder and head of design Levi Wilson to find out more about this all-American studio. What do you think makes Hammerton designs different from others? It’s a combination of bold design, beautiful scale & proportion and meticulous detail. The guiding fabrication principle at Hammerton is my "10-inch rule,” meaning that each fixture that leaves our Salt Lake City facility must be able to withstand a discerning eye from less than a foot away. We take enormous pride in crafting lights that look beautiful from any distance. Art, architecture, fashion, culture, and the natural world. We're unmistakably an American brand, but our sphere of inspirational influence is global. I travel a lot! What’s important to you in lighting design? 1) Perfect scale and proportion. It’s an inherently critical, yet often overlooked element of design. Not only does it apply to fixture design, but also to how a fixture fits in its intended space. 2) Balancing aesthetics and function—why sacrifice one for the other? This was a key motivator behind our Hammerton Studio brand—promoting functional solutions that can extend beautiful design throughout the home without breaking the budget. And, 3) having an element of surprise or delight, however bold or subtle it may be. 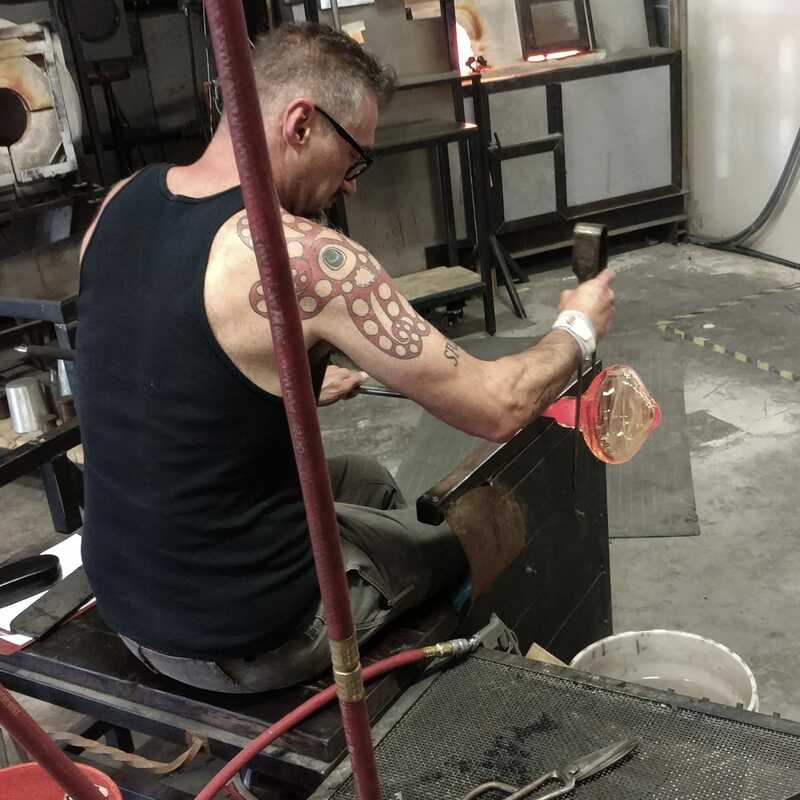 Hammerton Studio glassblowing artisan at work in the Salt Lake City studio. Do you have a particular style/aesthetic yourself? How does that play into your work? The Hammerton brand got its initial foothold in the early 1990s by serving the booming second home market in Park City, Utah, and other mountain resort communities in the west. At that time, our "style" was driven by the enormous demand for boldly designed, beefy steel fixtures that leaned toward a rustic or organic mountain look. Today, the majority of our business leans towards transitional and contemporary styles and incorporates an extensive palette of materials, including lots of glass and textiles. We were the first lighting manufacturer to incorporate woven steel mesh into our designs nearly a decade ago and we've seen that business explode. Mesh, particularly finely woven mesh, is a very tough material to fabricate in and few do it well. After so many years focusing on metalwork, Hammerton has really gotten into artisan glass recently. Why is that? 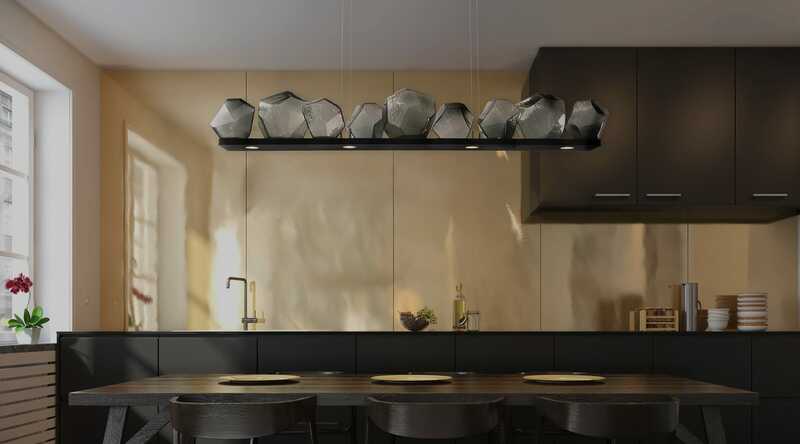 Pushing the boundaries of lighting design requires continuously expanding our palette of design elements. Glass is a very broad platform for design innovation. It allows us to evolve our work in several directions that are highly relevant to today’s market. Surprisingly, it’s our expertise in metal that allows us to do unusual work in glass, because we fabricate all our jigs in-house. Tell us a little more about how you create your glass. We primarily work with blown glass and kiln-fused glass. Although blown glass and kiln-fused glass involve the same material, each results in a unique set of characteristics. Inflating molten glass and working it in a furnace to achieve a desired shape is how you fabricate blown glass. Heating sheets or particles of glass in an oven until they fuse together or conform to a mold creates kiln-fused glass. Blown glass lends itself to rounded forms and sleek surfaces, while kiln-fused glass can be formed in a wide range of angular and curved shapes, and can also incorporate textures. We keep our ear to the ground and our eyes wide open. Our problem has always leaned in the direction of too many—rather than too few—design ideas. That's one reason we do a lot of custom work. What design "mistakes" make you cringe? Getting scale and proportion wrong, which is a pretty common mistake we see on both ends of the industry. What does your own studio or home look like? Somewhat eclectic; more of a reflection of the evolution of my design sensibility over 2+ decades rather than a snapshot of any particular era or style. Do you have a favorite Hammerton Studio fixture? Any of the Uptown and Downtown Mesh fixtures. They're simply styled and incredibly versatile, yet fascinating to look at. Mesh has both a strength and a softness that's wonderfully appealing.